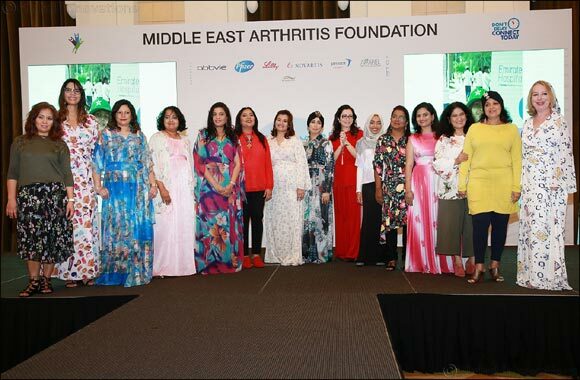 Dubai, UAE – 14th October 2018 – Over the weekend the Middle East Arthritis Foundation (MEAF) conducted its public community event at the Shangri-La hotel, Dubai to mark World Arthritis Day 2018 (WAD). Four hundred patients and their families and carers gathered to participate in several activities including a fashion show, nutrition and pain management sessions as well as free bone density and hand scan tests, all designed to create greater awareness of the chronic disease, support those who suffer from arthritis, and encourage early diagnosis. With more than 50 million people around the world diagnosed with some form of arthritis and one in five people in the UAE, it is imperative that preventative measures are taken early on. This year’s community event focused on children, adolescents, young adults and addressed pregnancy challenges for mothers-to-be. The community event which was open to the public featured a yoga session, followed by breakout sessions on nutrition and pain management by experts, with inspiring tales from arthritic patients on managing lifestyles. Sessions in Arabic for the benefit of the Arabic-speaking population were newly introduced this year. Attendees availed of the opportunity for a free hand scan as well as a free bone density and much more. The event culminated with a fashion show led by arthritic patients and doctors walking the ramp and modelling comfortable yet glamorous clothing and footwear. In its quest to combat arthritis, MEAF is actively supported by corporates in the UAE such as Novartis, AbbVie, Pfizer, Eli Lilly, Janssen, Newbridge, Apparel and other brands. Beyond its ongoing research in clinical treatments, MEAF is committed to improving the lives of people living with arthritis through real-world data collection, support for caregivers and patients as well as awareness programs.